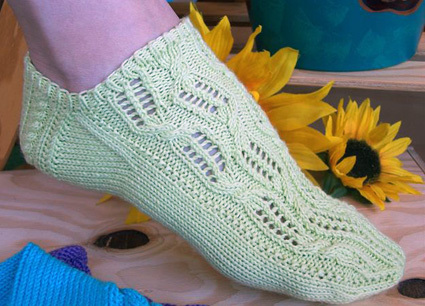 Perfect for summer (or for summer knitting for winter gifts): a “bare-all-ankle” sock. I love everything about this sock design: the low-cut cuff, the detailed heel, the cable and lace pattern (called “Tilting Ladder” in Barbara Walker’s Second Treasury) flanked by seed stitch columns on the top of the foot, and the beautiful merging of shaping and pattern at the toe. The sock may look alarmingly long and narrow while being knit, especially the larger sizes, but never fear, it’s really an optical illusion. In fact, it needs to stretch considerably to properly showcase the details and fit comfortably. Because the instep detailing both “gives” from the lace and “clings” like a ribbing from the cables, the sock can both stretch for wider feet, and stay on narrower ones. Although the pattern requires a little concentration, it can still be memorized, and with such short cuffs, the whole project is a “breeze” from start to finish. (Besides, gotta love a pair of socks out of a single skein or so!) If you prefer, work the optional rolled cuff on top of the ribbing for a different look, or make yourself a slightly higher ankle by working a couple of inches of the ribbing before continuing with the rest of the sock instructions. Whip off a few sets in different colors to get you through sandal season, and make some extras for gifts! Shown in all 3 sizes; Modeled above in Medium. (the socks will lose some length due to horizontal stretching when worn on a foot). Sandnesgarn Mandarin Petit [100% Egyptian Cotton; 196 yd/180 m per 50g skein]; shown in #5226 purple, #8722 green, and #6705 turquoise. Optional Rolled Cuff: 1[2, 2] skeins. C4B = Cable 4 Back: Slip next 2 sts to cable needle and hold to back of work; k2 from left needle, k2 from cable needle. C4F = Cable 4 Front: Slip next 2 sts to cable needle and hold to front of work; k2 from left needle, k2 from cable needle. Repeat this round for 1x1 Rib. Round 1: P3, [k5, p1, k5, p2] twice, p1. Round 2: K1, p2, [k1, (yo, k2tog) twice, p1, k5, p2] twice, k1. Round 3: P3, [k5, p2, k4, p2] twice, p1. Round 4: K1, p2, [k1, (yo, k2tog) twice, p2, k4, p2] twice, k1. Round 6: K1, p2, [k1, (yo, k2tog) twice, p2, C4B, p2] twice, k1. Rounds 7-10: Work as for Rounds 3-6. Rounds 11-12: Work as for Rounds 3-4. Round 13: Work as for Round 1. Round 14: K1, p2, [k5, p1, (ssk, yo) twice, k1, p2] twice, k1. Round 15: P3, [k4, p2, k5, p2] twice, p1. Round 16: K1, p2, [k4, p2, (ssk, yo) twice, k1, p2] twice, k1. Round 17: Work as for Round 15. Round 18: K1, p2, [C4F, p2, (ssk, yo) twice, k1, p2] twice, k1. Rounds 19-22: Work as for Rounds 15-18. Rounds 23-24: Work as for Rounds 15-16. Repeat Rounds 1-24 for Cable/Lace Pattern. Row 1 [RS]: P1, k1, p1, k1, [p1, k4, p1, k1, p1, k1] 3 times, p1. Row 2 [WS]: Sl 1 with yarn held to front of work, [p3, k1, p4, k1] 3 times, p3, sl 1 with yarn held to front of work. Row 3 [RS]: P1, k1, p1, k1, [p1, C4B, p1, k1, p1, k1] 3 times, p1. Row 4 [RS]: Work as for Row 2. If working Rolled Cuff, k 8 rounds before proceeding. Work 4 rounds in 1x1 Rib. Place last 16 sts from Needle 3 and first 16 sts from Needle 1 on Needle 1. Distribute remaining 30 sts between Needles 2 and 3. The heel flap will be worked back and forth over the 32 sts on Needle 1. With RS facing, rejoin yarn to work. Work 34[34, 36] rows in Heel Pattern (flap measures approx. 2.25[2.25, 2.5] inches). Row 2 [WS]: Sl 1, p20, p2tog. Turn work. Row 3 [RS]: Sl 1, k10, sl 1, k1, psso. Turn work. Row 4 [WS]: Sl 1, p10, p2tog. Turn work. Repeat Rows 3 and 4 8 times more, then work Row 3 once more. 12 sts remain on Needle 1. Slip the sts from Needle 3 to Needle 2. 30 sts on Needle 2. With RS facing and using an empty needle, pick up and k 17[17, 18] sts (1 st in each slipped st) along left edge of heel flap. From this point, this needle will be designated Needle 1. Work Round 1 of Cable/Lace Pattern over sts on Needle 2. Using another empty needle, pick up and k 1 st in each slipped st along remaining edge of heel flap, then work first 6 sts from bottom of heel flap. This point will now be beginning of round; needle just used will be designated Needle 3. Slip remaining 6 sts from bottom of heel flap to Needle 1. Needles 1 and 3 each hold 23[23, 24] sts, and Needle 2 holds 30 sts. 76[76, 78] sts. Round 1: K to last 3 sts of Needle 1, k2tog, k1; work sts on Needle 2 in Cable/Lace Pattern; k1, ssk, k to end of Needle 3. Round 2: K to end of Needle 1; work sts on Needle 2 in Cable/Lace Pattern; k to end of Needle 3. Repeat these 2 rounds until there are 14[14, 15] sts each on Needles 1 and 3; 58[58, 60] sts in total. Continue in pattern until full 24-round repeat of Cable/Lace Pattern has been worked 2.5[3, 3.5] times (ending with Round 12[24, 12] of pattern). Work measures approx. 5.5[6.75, 8.25] inches from beginning of Cable/Lace Pattern. Set-up Round 1: K to end of Needle 1; work Round 15 of Cable/Lace Pattern over sts on Needle 2; k to end of Needle 3. Set-up Round 2: K to last 3 sts of Needle 1, k2tog, k1; k1, p2, [k1, k2tog, k2tog, p2, k1, k2tog, k1, p2] twice, k1; k1, ssk, k to end of Needle 3. Set-up Round 1: K to end of Needle 1; work Round 3 of Cable/Lace Pattern over sts on Needle 2; k to end of Needle 3. Set-up Round 2: K to last 3 sts of Needle 1, k2tog, k1; k1, p2, [k1, k2tog, k1, p2, k1, k2tog, k2tog, p2] twice, k1; k1, ssk, k to end of Needle 3. Set-up Round 1: K to last 3 sts of Needle 1, k2tog, k1; work Round 15 of Cable/Lace Pattern over sts on Needle 2; k1, ssk, k to end of Needle 3. 58 sts. There are 13 sts each on Needles 1 and 3, and 24 sts on Needle 2. 50 sts. Round 1: K to end of Needle 1; p3, [k1, p1, k1, p2] 4 times, p1; k to end of Needle 3. Round 2: K to last 3 sts of Needle 1, k2tog, k1; k1, p2, [k3, p2] 4 times, k1; k1, ssk, k to end of Needle 3. 48 sts. Round 3: Work as for Round 1. Round 4: K to last 3 sts of Needle 1, k2tog, k1; k1, p2tog, k3, [p2, k3] 3 times, p2tog, k1; k1, ssk, k to end of Needle 3. 44 sts. Round 5: K to end of Needle 1; p2, [k1, p1, k1, p2] 4 times; k to end of Needle 3. Round 6: K to last 3 sts of Needle 1, k2tog, k1; k1, k2tog, k2, p2, [k3, p2] twice, k2, ssk, k1; k1, ssk, k to end of Needle 3. 40 sts. Round 7: K to end of Needle 1; p1, [k1, p1, k1, p2] 3 times, [k1, p1] twice; k to end of Needle 3. Round 8: K to last 3 sts of Needle 1, k2tog, k1; k1, ssk, k1, p2, [k3, p2] twice, k1, k2tog, k1; k1, ssk, k to end of Needle 3. 36 sts. Round 9: K to end of Needle 1; p1, k2, p2, [k1, p1, k1, p2] twice, k2, p1; k to end of Needle 3. Round 10: K to last 3 sts of Needle 1, k2tog, k1; k1, ssk, p2, [k3, p2] twice, k2tog, k1; k1, ssk, k to end of Needle 3. 32 sts. Round 11: K to end of Needle 1; p1, k1, p2, [k1, p1, k1, p2] twice, k1, p1; k to end of Needle 3. Round 12: K to last 3 sts of Needle 1, k2tog, k1; k1, ssk, p1, k3, p2, k3, p1, k2tog, k1; k1, ssk, k to end of Needle 3. 28 sts. Round 13: K to end of Needle 1; [p1, k1] 3 times, p2, [k1, p1] 3 times; k to end of Needle 3. Round 14: K to last 3 sts of Needle 1, k2tog, k1; k1, ssk, k3, p2, k3, k2tog, k1; k1, ssk, k to end of Needle 3. 24 sts. Round 15: K to end of Needle 1; p1, k2, p1, k1, p2tog, k1, p1, k2, p1; k to last st on Needle 3, k last st of Needle 3 together with first st of Needle 1, k remaining 5 sts from Needle 1 onto Needle 3. 11 sts each on Needles 2 and 3. Break yarn, leaving a 12-inch tail. Graft sts from Needle 2 together with sts from Needle 3. 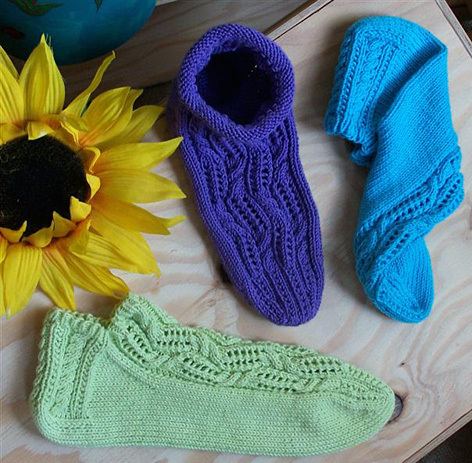 Jennifer L. Appleby designs knitwear and sells yarn in north central British Columbia while wearing ankle socks. She regularly contributes to magazines such as Interweave Knits, Interweave Crochet, and Knitscene, and designs for her own leaflet line, The Woollen Earth. Visit thewoollenearth.com to view her entire collection, purchase kits for the same, and read her blog, "Knitting in the Sticks" (yes, she really does live in the sticks).